This well-balanced composition has already been used for several hundreds of years to inspirit water by countless people all around the world. Experts claim that amethyst stimulates the mind and soothes emotions. Rose quartz fosters tranquility and harmony. Clear Quartz is a stone for clarity and perception. As a combination, they’re used for their wonderfully invigorating effect. GemWater prepared with this harmonic blend is the best “everyday water”. Handcrafted, lead-free, borosilicate glass bottle. Gemstone mix: amethyst, rose quartz, clear quartz. Reusable bottle increases oxygenation and boosts alkalinity (pH) of everyday tap, filtered, or bottled water up to 8.02 in 7-10 minutes. Sealed GemPod holds fair-mined, semiprecious, tumbled gemstones. Stainless steel caps with BPA-free plastic lining. If your goal is overall well being, the quintessential VitaJuwel Wellness blend is for you. 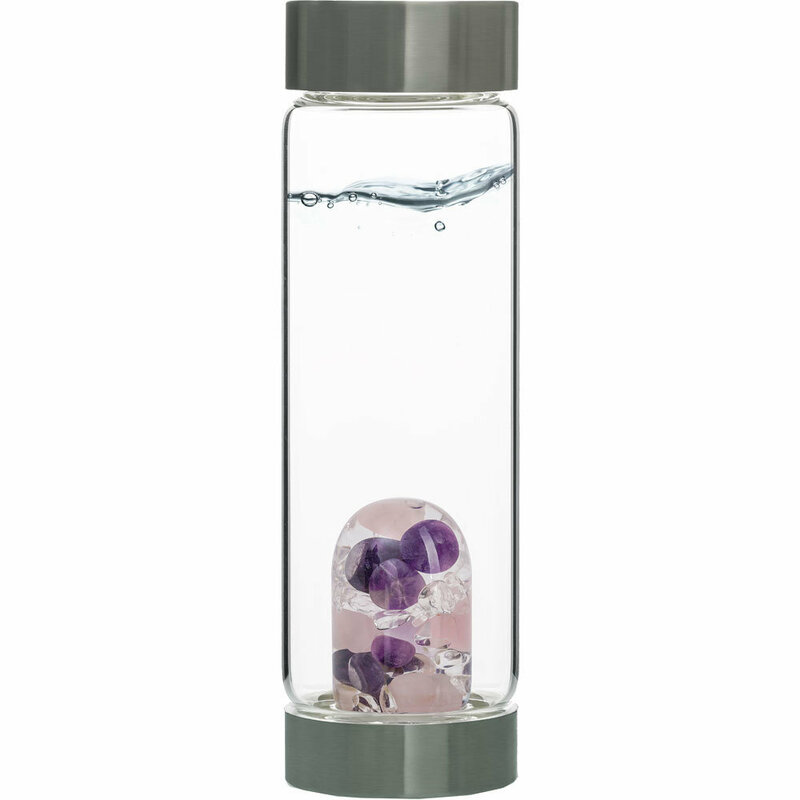 If you're unsure which Gem-Water blend might best suit you, choose Wellness to start your collection. In the natural healing arts, the blend of amethyst, rose quartz, and clear quartz is said to stimulate and soothe the mind and emotions, foster tranquility, and support healthy and radiant skin. everyday water in just 7 to 10 minutes. Each vial is hand blown and holds a blend of semiprecious gemstones that naturally vibrate at a frequency that restructures or "wakes up" water boosting its alkalinity (pH) as high as 8.02 and raising its oxygenation. The result is enlivened water with qualities comparable to spring water. The smoother/softer mouth feel makes for a refreshing taste experience and improved hydration for the body. Wash water bottles thoroughly before first use. The glass bottle itself is dishwasher safe. The gempod and caps are NOT dishwasher safe. To clean, unscrew gempod from bottom cap. Wash water bottle parts by hand with warm, soapy water. Allow all parts to dry completely. Securely, but gently, reassemble parts. DO NOT open the specially sealed gempod. After extensive use, water products can develop limescale, simply use lemon juice or vinegar essence to remove. We suggest cleaning your water bottles at least every 2-3 days. When filling your water bottle, run water directly into the top. Do not let water run over edges of the opening or water will accumulate in the groove between the glass and bottom gempod cap giving the impression that it is leaking. If water has run over, put the top cap on and simply turn the bottle upside down to let the excess water out. SAFETY: Handle all your water bottles with care, they are precious / Treat your products as you would any other glassware / Avoid impacts / Do not freeze or microwave / If any damage to your items occurs to your water bottle, stop usage immediately / Keep away from young children.